Holiday Deals on the Nikon D600 continue even after Christmas. You can still pick up the D600 plus 24-85mm VR lens kit for $1996 for a limited time, but now you can also score a Factory Refurbished Nikon D600 body for only $1679 including a 1 year warranty from Cameta Camera. That is over $400 off the retail price! Factory refurbished items are returned to the factory and inspected by Nikon and any repairs necessary are made. Refurbished cameras are often are more thoroughly checked than new ones off the assembly line. Although refurbished gear normally carries a 90-day Nikon warranty, Cameta includes a 1 year warranty. The factory new Nikon D600 with 24-85mm VR lens for $1996 deals are available through December 29, 2012. Some notable deals include this Amazon D600 deal offering a bonus 4% in addition of 2% cash back, for a total of 6% (that’s $119.82) good toward future purchases. You can also get 12-month 0% financing from Amazon. B&H Photo is offering two bundle deals on the Nikon D600 for $1996. The first one is a D600 Video Enthusiast Bundle which includes D600 + 24-85mm VR lens + Rode VideoMic ($149 value) + Fuzzy Windbuster mic cover ($29) + SanDisk Extreme 32GB SDHC card ($35 value) plus free shipping and 2% reward ($39.94) — totaling over $250 in extras and $910 off the retail price. The other deal is the D600 Photo Enthusiast Bundle with the D600 + 24-85mm VR lens + SanDisk Extreme 32GB SDHC card ($35 value) + Oben Aluminum Tripod model AC-1310 with Ball Head model BA-0 ($99 value) plus free shipping and 2% reward. These deals are good through December 29, 2012. The Nikon D600 is now available with a free Nikon 24-85mm VR lens! Get it all for $1996.95! The best deals going now is at B&H Photo, who are also including an extra battery, memory card, monopod and a camera bag. Total value of free items is over $880! Plus get free 2-day Air shipping and a 2% now 4% Reward that can be redeemed on a future purchase. There has never been a better deal on the amazing new full-frame camera from Nikon. At this price you are getting a free $600 lens. The D600 body is selling for the same price without any lens! Just three months ago the D600 was first released and was selling at $2695 with the lens with no extras or rebates. You can also get this great deal at Amazon. Total price of $1996.95 for the D600, plus 24-85mm VR zoom lens, plus 2% back in rewards, free Transcend 32 GB Memory Card, AmazonBasics Backpack and a Free Class on Demand $100 Black Card, as well as free shipping. The busiest shopping day of the year near and many retailers are running special promotions well ahead of Black Friday (the day after Thanksgiving). The Nikon D600 body-only now includes an extra $100 off at several retailers and this amount increases to $200 off when purchased with the 24-85mm VR kit lens. To sweeten the deal, B&H Photo, Adorama and Amazon offer 2% rewards for purchasing the D600 which can be redeemed for a future purchase, while J&R offers 1% rewards on Nikon products. Some retailers go even further and include free items with the D600: B&H Photo includes a SanDisk Extreme Pro 16GB SDHD card, Lowepro Rezo camera bag and Pearstone battery pack — a $114 value. Adorama throws in a Transcend 32GB SDHC card and Lowepro Rezo camera bag but their bundle does not include the 2% reward. All discounts, rebates and free items considered, the best deal for the D600 is at B&H Photo: D600 body for $1996.95 and the D600 + 24-85mm VR Lens for $2496.95 including free shipping. 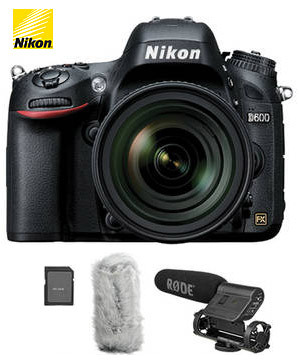 You can also get the D600 body + 28-300mm VR Lens for $2896.95 a $250 savings and plus a free camera bag and 32GB SD card. 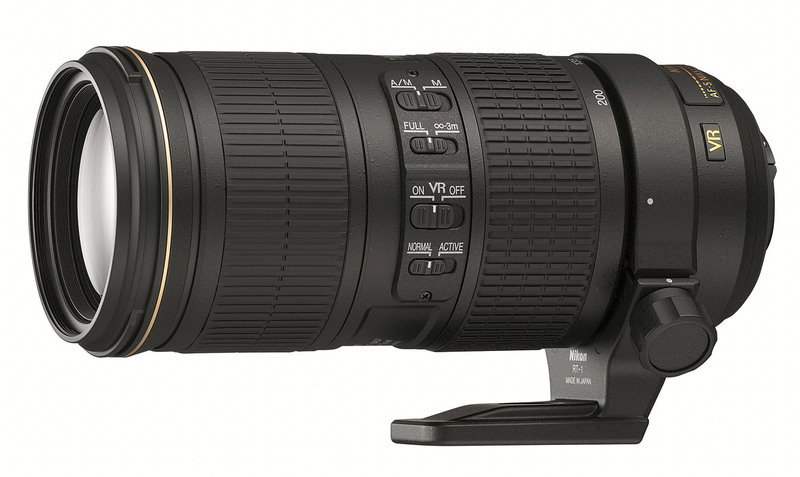 Nikon announces the latest F4 constant aperture zoom lens, the NIKKOR 70-200mm F/4 ED VR telephoto zoom. The lens features the familiar focal length that is popular with full-frame photographers with the latest third-generation VR stabilization technology. The lens provides enthusiasts and professionals outstanding sharpness and contrast for the latest FX cameras including the D4, D800 and D600. These cameras can use Nikon’s teleconverters to increase focal length up to 400mm, and take advantage of autofocus using cross-type sensors available at F8. The 70-200mm F4 VR lens offers a 2.9X zoom range with constant aperture F4 throughout. Minimum focus distance is 3.28 feet and maximum reproduction ratio is 0.274X. The lens features 20 elements in 14 groups and incorporates Nikon’s Nano Crystal Coat to reduce the appearance of internal ghosting and flaring when photographing bright light sources. It uses a 67mm filter size. The lens has internal AF-S focusing with Nikon’s Silent Wave Motor to reduce noise while shooting video and provide outstanding focus speed. The lens also provides instant manual focus override in M/A mode. Dimensions are 3.1 inch diameter and 7 inch length. Weight is approximately 30 oz (850g). The lens includes 67mm lens cap, HB-60 hood, LF-4 rear lens cap and CL-1225 semi-soft case. An optional lens collar with foot RT-1 is available at $233.95 US retail. The new Nikon 70-200mm F4 will be priced at $1399.95 US and will be released in late November 2012. Nikon product number 2202. Adobe Camera Raw 7.2 and Adobe Photoshop Lightroom 4.2 have been released and add preliminary support for Nikon D600 RAW files. 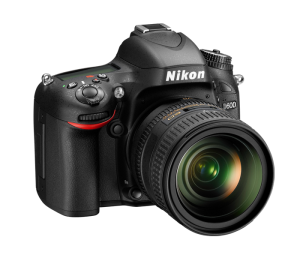 The new ACR and Lightroom versions released on October 3, 2012 can read Nikon Electronic Format (NEF) files created by the Nikon D600, although it is not documented in Adobe’s release notes. Certain features such as automated profile corrections and picture controls are not yet implemented. Full support should be expected in a future release. 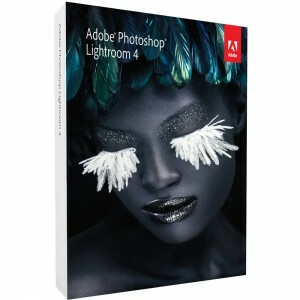 Update: Adobe Lightroom 4.3 and Adobe Camera Raw 7.3 are released and add official Nikon D600 support as of December 13, 2012. Currently, full D600 RAW support is available using Capture NX2 version 2.3.4. Lightroom 4.2 also includes new lens profiles for Nikon 24-85mm f/3.5-4.5G VR and 18-300mm f/3.5-5.6G VR as well as various bug fixes to improve usability. Support for Nikon D600 RAW files in Adobe Photoshop CS6 is available by downloading Adobe Camera Raw 7.2, which provides RAW support for additional camera models and lens profiles. Photokina only comes around once every two years, and this year’s show in Cologne, Germany featured some monumental introductions from camera and lens manufacturers. The Nikon D600 was announced just before the show, but Photokina 2012 marked the public debut of this new full-frame DSLR as well as its official release date. By the time the camera was seen at the show, it had already been in production for months to build initial inventory to meet demand. 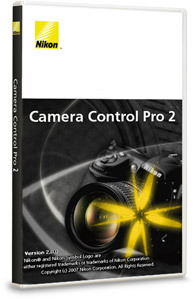 An update for Nikon Camera Control Pro 2 software is available to add support for the Nikon D600. The update utility will work with existing versions of Camera Control from 2.8.0 through 2.11.1. Support for the D600 is added to both Windows and Mac versions. Camera Control Pro 2 allows you to remotely control the D600 and other Nikon cameras through the USB connection. The software provide live view display on the computer screen. Camera Control allows you to remotely adjust exposure, shutter speed and aperture. Video features include remotely starting and stopping recording. Camera Control 2 is not the only way to remotely operate the D600. Using the optional WU-1b wireless transmitter, you can download a free app for your smart phone or tablet (Android and iOS) to control the camera. 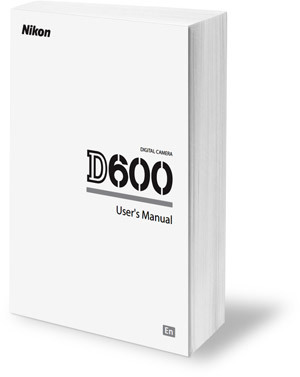 Nikon D600 User Manual is now available for download from Nikon Europe. The 340-page instruction book covers the user and technical details of the D600 DSLR. As of Tuesday September 18, the new camera is available at retailers worldwide. Nikon D600 Scores Big in DxO Test, Scores 94 to the D800’s 95! 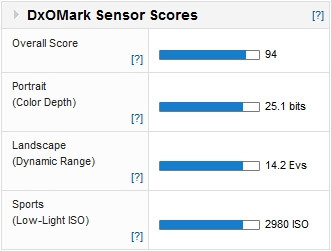 DxO just released their sensor tests for the Nikon D600, and the new full-frame DSLR has posted a 94 overall score! It looks like the D600 has been cheating off the D800’s test! When DxO tested the Nikon D800, it scored a 95 while the D800E scored a 96. In low light testing, the D600 rivals the D800/D800E with a DxO score of 2980 ISO. The difference between the cameras is imperceptible. The Nikon D600 scored a dynamic range mark 14.2 EVs, which is only 0.2 shy of the D800. When put head-to-head against the previous generation $8,000 24MP full-frame D3X, the D600 stands out as the winner with 1/2-stop better dynamic range. 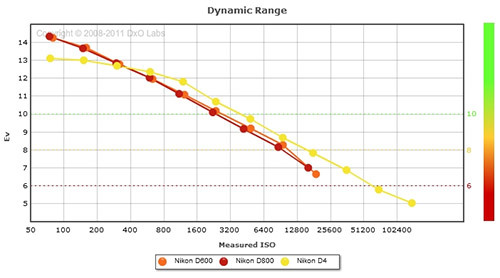 At base ISO, the D600 (as well as the D800/D800E) surpass even the D4 at dynamic range. Only at high ISO does the D4 begin to pull ahead. When compared with the current Canon full-frame, the D600 blasts past the 5D Mark III with a 2.5 stop advantage in dynamic range. DxO has not yet tested the new Canon EOS 6D, but it would seem to be a tall feat for Canon to make significant improvements over the 5D Mk III at the 6D’s $1400 lower price point. The Canon EOS 6D is not expected to be released until December. Just 5 days after its announcement, the Nikon D600 is now in stock now at Amazon. 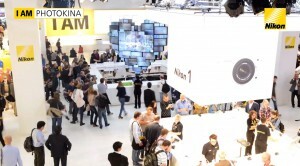 Nikon prepared for the D600 launch by building up enough stock to fill initial orders. The Spetember 18 availability date given by Nikon is indeed accurate. Retailers around the world are have been receiving their D600 shipments and today marks the first day of official availability. The D600 is currently #1 on the Best Sellers in DSLR Cameras on Amazon, whereas the new Canon EOS 6D is in the number 7 position on the same list. The Canon 6D is not expected to be available until December, 2012. When Nikon announced the 24MP D600 on September 13, it was the smallest and lightest full-frame DSLR to date. Then on September 17, Canon announced their new full-frame 6D which became the new lightest full-frame DSLR. A comparison of D600 vs 6D specifications reveals there are many similarities between them; the D600 comes out ahead on many specifications, but the 6D adds some extras such as built-in WiFi and GPS. Nikon D600 + 24-85mm VR Lens Save $100-200 on Select Lenses! The NEW Nikon D610 is available for pre-order. Estimated availability October 18, 2013. Pre-order now to assure early delivery. HOT DEALS on the D600! Up to $600 off! 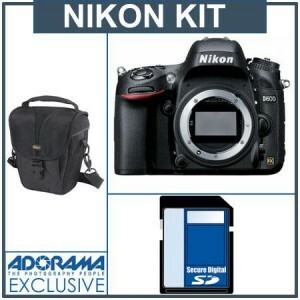 See more Nikon D600 Deals and Promotions updated frequently. Cyber Monday Deals: Nikon D610 for $1799, Lightroom 5 for Half Off!